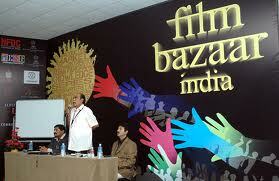 In a major attraction for regional movie-makers, Film Bazaar to be held on the sidelines of International Film Festival of India (IFFI) in Goa will conduct a trade analysis of cinemas of four Indian languages. National Film Development Corporation (NFDC) annually holds the Film Bazaar, which would be kicked off this year on November 20 when IFFI starts here. "During the film bazaar, there will be trade analysis over four days of various regional cinemas - Marathi, Bengali, Punjabi and Malayalam - highlighting gap areas as well as investment and growth opportunities," a NFDC spokesman said in a press release here. The film bazaar will also bridge the gap between film financiers and filmmakers, especially in the regional cinema through the investors' pitch. "The Investors' Pitch will be held over two days wherein new projects shall be put forth before potential investors looking for investment opportunities in the domain of film production," the spokesman said. The film bazaar will also have a 'master class' (an interaction of cinema experts) with acclaimed filmmaker and producer Vidhu Vinod Chopra, to be conducted by Sudhir Mishra. The 'Three Idiots' maker is currently working on his next production 'Wazir' starring Amitabh Bachchan, to be directed by Bejoy Nambiar. The Film Bazaar will also explore opportunities of working in international domain and will have specific sessions with filmmakers from Korea, Canada and China, the spokesman said, adding that there will also be a conversation of producer-director Karan Johar with TV anchor Rajeev Masand.